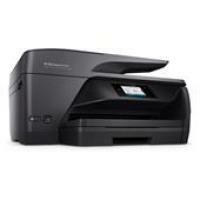 The OfficeJet Pro 6966 All-in-One is an easy to use printer for producing good quality documents and photos. The printer is reliable in nature and comes in an affordable range. It is ideal for any small office or busy home purpose that has the potential to handle a busy workload. This All-in-One printer has plenty of mobile printing features that does not require a computer to print the documents. It has Wi-Fi connectivity which makes it extremely durable and provides flexibility to print from anywhere, no matter how far you are from your computer. The printer’s functions are more centralised and printing of photos is extremely fast and easy to handle. Due to its all-in-one nature, the printer is capable of printing, scanning, and copying the documents more efficiently. It is an affordable device with adequate features and is perfect for everyday business use. With the XL range of HP OfficeJet Pro 6966 ink cartridges, one can print a maximum number of pages without worrying about the ink replacement procedures. With the advantage of being quick in printing photos, the printer aims at delivering high-quality photo prints in less time compared to other printer models of the same range. OfficeJet Pro 6966 has HP printer control functions which allows you to perform all the printing task in ease. On the whole, the printer is best to use for any type of printing work. What should be done when ‘Incorrect Print Cartridge’ or ‘Print Cartridge Problem’ error message displays on the computer screen? Step 1: Check if the HP OfficeJet Pro 6966 ink cartridge is in full contact with the printer. If it is not, the computer might display an error message. Step 2: Remove the cartridge and then reinstall it. Push down the cartridges to release it from the printer, and then pull it towards you to remove it from its slot. Gently slide the HP OfficeJet Pro 6966 ink cartridge into the empty slot and then push on the upper part of it until it fixes into the place. Close the cartridge access door then try to print a page. Step 3: If the error message is displayed on the computer screen even after reinstalling the HP OfficeJet Pro 6966 ink cartridges then reset the printer. Turn the printer off. Disconnect the power cords from the printer for 30-40 seconds and then reconnect. Turn the product on while pressing and holding the resume button for 10-20 seconds. The attention light will turn on. Release the resume button. This process will restore factory defaults. Caution: Do not touch the copper-coloured electrical chip or the ink nozzles. This might result in low-quality printing, ink failure or bad electrical connections. Q. I have spare HP OfficeJet Pro 6966 ink cartridges as my printer no longer works. I am looking to buy a printer that uses the same ink cartridges as I am happy with the printing quality. Is it possible for me to find other printers using the same ink cartridges as the HP OfficeJet Pro 6966 All-in-One printer? A. Yes, there are various other printer’s that require the same ink cartridges as HP OfficeJet Pro 6966 All-in-One printers. You can find the list of printers compatible with the ink cartridge on the packaging of the cartridges. If you no longer have the packaging, you can also find the list here. Q. The ADF of my printer is not taking in pages when I initiate a print job. What should I do to solve this problem? Lift the ADF cover. You will be able to access the roller and the separator pad. Lightly dampen a cloth and squeeze the cloth to remove excess water. Wipe the residue off the separator pad and rollers and close the cover of the ADF. Q. How will I know that the ink levels of my HP OfficeJet Pro 6966 ink cartridges are running low, so that I can order for a replacement? A. The user is be notified by your printer when the ink supplies are running low. The printer will still continue to print but will require a replacement soon. The printer also prompts when the ink cartridges are empty so that they can be replaced. You can also check the current ink levels by pressing the ink button on the printer’s control panel. Q. Should I clean the printhead regularly? A. You should only clean the printhead when you are experiencing printing problems. This is because cleaning the printhead requires ink to be supplied from the HP OfficeJet Pro 6966 ink cartridges and this reduces the life of the cartridges.